In 2017 we ran seven zones. Three I’m an Engineer zones in February–March (Energy, Health, and Space), and four I’m a Scientist zones in November (Diagnosis, Energy, Food, and Fluorine). We have improved on engagement rates in IAS since previous years. With more schools and students registering than the historic average (average of 12 schools and 384 students per zone), additionally the percentage of students actively participating in ASK, CHAT, VOTE, or leaving a comment is up to 90%. This has led to more questions being asked and answered than the historic averages. 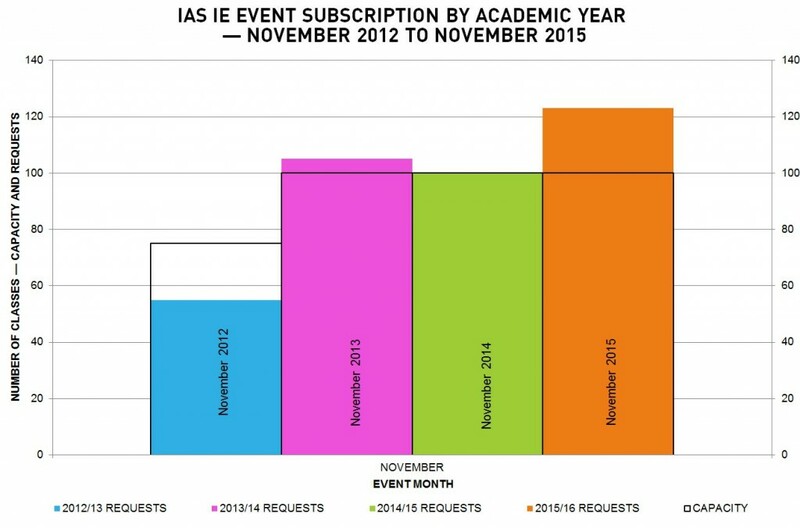 The percentage of active students in IAE however, has dropped to 80% with fewer questions in ASK, or lines of live CHAT. We have been successful in using online engagement to reach students who are normally under-served by the sector. In total, 1,111 students from target schools (DEIS, or in an SFI target county) actively participated in the events; 54% of the active participants. Taking part improves attitudes of scientists and engineers to public engagement. The experience made them more confident in communicating their work, and 96% of respondents felt that they’d like to take part in more public engagement. Taking part leaves most students feeling more positive about working in a STEM career. However, for a proportion of those initially not likely to consider a STEM career, the event confirms their decision. 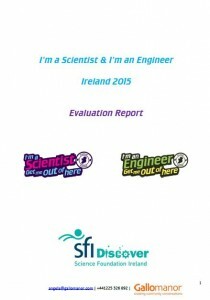 In the I’m a Scientist Ireland project pilot in 2012 we ran three zones, since then we have run four zones every year. While we were under capacity in the pilot, the demand for the activity from teachers has remained relatively consistent and looks to be increasing. Assuming the trend carries on, we would easily be able to run a fifth or even sixth zone in November this year. The story in I’m an Engineer is a little different. For the past couple of years we have run two I’m an Engineer events each year; one with the I’m a Scientist event in November, and one in February to coincide with Engineers Week Ireland. 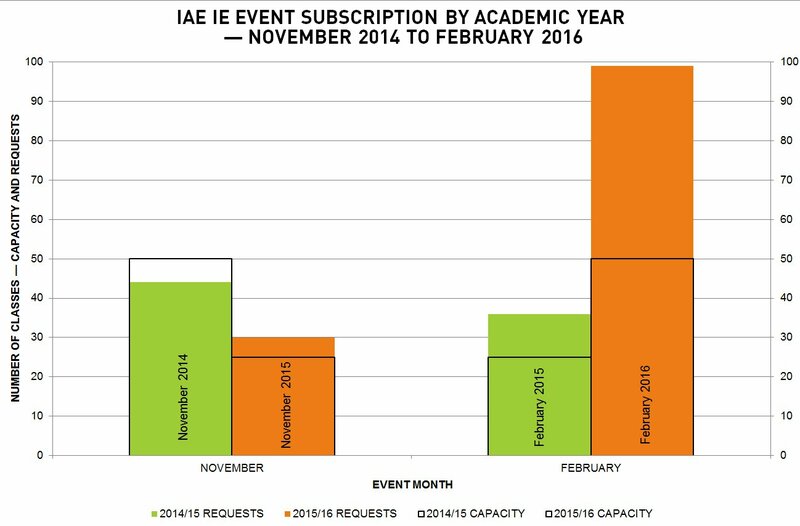 In the first year, we saw teachers favouring the November event albeit only slightly, in 2015/16 though we saw a huge shift towards February, with demand being almost twice what was expected. The increased demand is too big to come only from existing teachers opting to take part during Engineers Week instead of earlier in the year. More investigation is needed to say how much, but a lot of the demand must have come from new teachers signing up. In November 2016 there will be no I’m an Engineer event. Our plan is to move the Engineer activity to February alone, keeping the Scientist activity in November. What is clear — clearer still where we combine the data sets— is that the school demand for our online STEM engagement activities is growing. We need to find ways to increase capacity and offer more students in Ireland the opportunity to take part. We had a quick look at how many of the class requests discussed above came from schools in different countries. 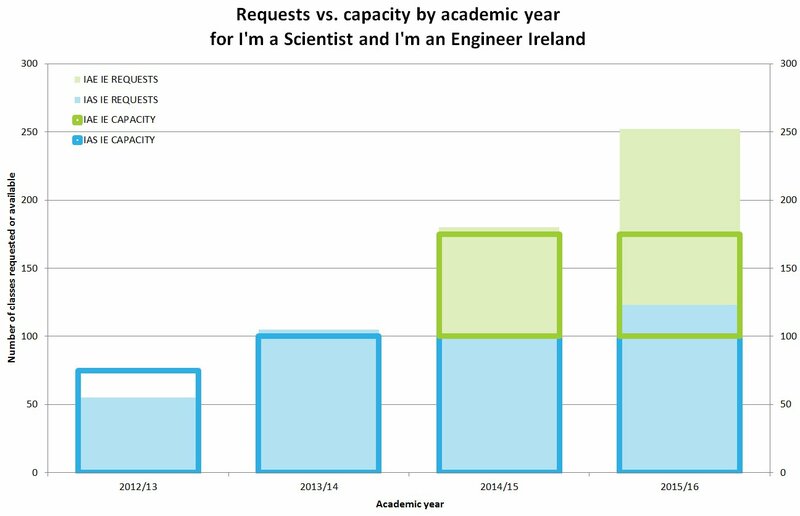 As the graphs show, the majority of requests are coming from schools in the Republic of Ireland, with far fewer coming from Northern Ireland, and the occasional request from a couple of international schools. Schools in Northern Ireland have always been invited to take part in the Irish events as well as the UK events. Moving forward, Northern Irish schools will be invited to take part in the UK events only. The occasional international school taking part will now be asked to pay a small charge to do so, this cost to the school will go towards running additional zones in the future. In 2015, we ran six zones: Three I’m a Scientist themed zones (Nanoscience, Drug Synthesis and Food Science), one I’m a Scientist general zone (Nitrogen Zone) with a mix of scientists from different areas, one I’m an Engineer themed zone around computing (Boole Zone) and one general engineering zone (Metre Zone). 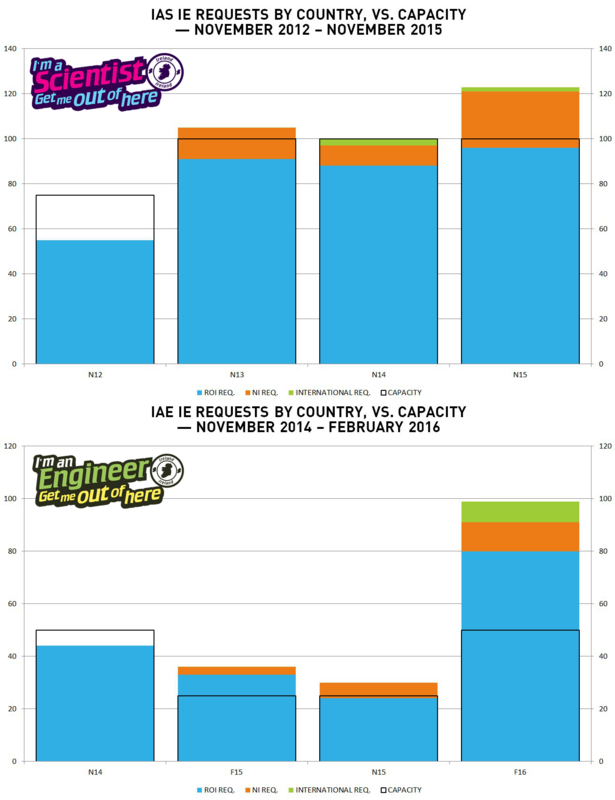 We have improved I’m an Engineer audience numbers since last year. 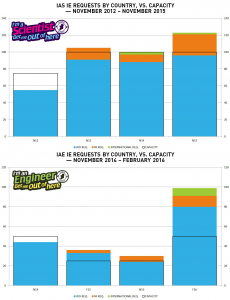 In 2014 we ran I’m an Engineer for the first time in Ireland and we got an average of 208 students logged in per zone. In 2015, we have even exceeded our target of 330 students per zone, with 377 students in the Boole Zone, and 350 in the Metre Zone. We have improved the diversity of the scientists and engineers taking part. 10% of the participants were from a black or minority ethnic background, and we got a perfect gender balance in both I’m a Scientist and I’m an Engineer. 90% of students think they know more about the skills required to be an engineer, the type of people who work as engineers, and engineers’ role in society after taking part in I’m an Engineer. 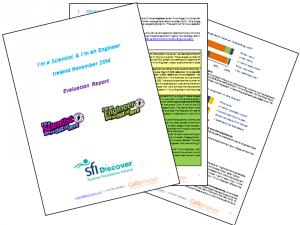 In November 2014 we ran I’m a Scientist in Ireland for the third time, and we run our first I’m an Engineer event in Ireland. We ran four I’m a Scientist and two I’m an Engineer zones. Two of the I’m a Scientist zones were themed (Evolution and Sustainability) and two of them were general (Boron and Beryllium). One of the I’m an Engineer zones was themed (Energy) and the other one was general (Kelvin). The funding for this project comes in part from the Science Foundation Ireland and the other half comes from elsewhere. We’ve got funding from the Wellcome Trust, the European Society for Evolutionary Biology and the Royal Society for Chemistry. Traditionally we try to get a zone funded by large company employing lots of scientists and engineers. A company whose business relies on a science friendly population and education system. Traditionally we get nowhere. This year we thought we’d try something different. We thought we’d ask lots of small companies who rely on scientists and engineers to fund us a little. We thought we’d try crowdfunding. We created two FundIt.ie campaigns and promoted them both through our networks and through other networks. The response was almost non-existent. Why? We could have promoted it harder. But it was clear from our initial publicity that promotion wasn’t leading to pledges. From our first burst of activity we had such a little response that it was clear that even an enormous amount of promotion would still have left us short. Companies need time to plan. Yes, they do, but it was my expectation that the amount of money we were asking for would be discretionery spend. And the one pledge of €250 showed that to be a possibility. Companies don’t understand science engagement. Sure, there are some companies who understand what you mean by science outreach and engagement. But perhaps not that many and perhaps not so much those who also have the flexibility to pledge €250. I found myself having to explain the event and what it was trying to do. I’m not convinced it was fully appreciated. People don’t get crowdfunding. Sure you do. You’re reading a blog that you probably found via a link on twitter. You get crowdfunding because you’re part of the online crowd. but the people running small businesses don’t get it in the same way. It’s not the norm. A central concept of crowdfunding is that unless the campaign is successful it doesn’t cost you, the pledger, a cent. It’s brilliant. It means you only buy into SUCCESS. But that isn’t blindingly obvious. I think it is still some time before it becomes mainstream. Will we try next year? I think so. We’ll start earlier. We’ll prime the audience a little more. And if we fail again, we’ll make sure we learn again. In November 2013 we run I’m a Scientist in Ireland for the second time. We run 4 zones: two themed on Nanotechnology and Space and two general zones named Helium and Lithium with a mix of 5 scientists. Back in November 2012 we ran I’m a Scientist in Ireland for the first time. In short, it was a real success. The enthusiasm shown by teachers, students and scientists was magnificent and the students really got into the spirit of the event. 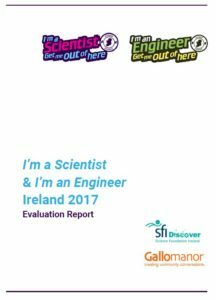 The full evaluation report is up on the Irish site (imascientist.ie/2013/05/15/evaluating-im-a-scientist-in-ireland/) alongside a short summary of our findings. In summary, we would love to run more events in Ireland.